The exceedingly colorful Strokers Dallas bike club/bar-restaurant will get a second dose of exposure in a new Tru TV series being produced by AMS Pictures of Dallas. Rick Fairless owns and operates the Harry Hines Blvd. emporium, but the working title of the show is Ma's Roadhouse. That's because his ma, Sharon, is a heavy-duty hoot. Fairless and company also starred in Texas Hardtails, a 2005 series on Speed Channel. 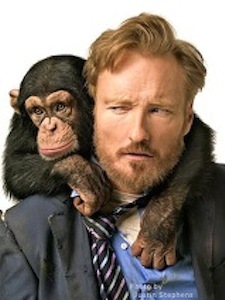 ***Conan O'Brien, whose settlement with NBC allows him to resume doing TV on May 1st, will waste no time in getting part of his story out. He'll be interviewed by 60 Minutes correspondent Steve Kroft on the Sunday, May 2nd edition of the program. He still can't disparage NBC, though. Damn. ***TNT has ordered another 10 episodes of the cop drama Southland, which it rescued after NBC canceled it last season. The new episodes will begin airing in January. ***Comedian/actor Ricky Gervais will be the back-to-back host of The Golden Globes, which return to NBC on Sunday, Jan. 16th with another grand exhibition of movie and TV celebrities getting semi-sloshed while expectantly waiting for their names to be called. "I can't believe they invited me back after (the) awful things I said," Gervais said in a publicity release. "Let's see how far I can go this time." NBC's executive vice president of alternative programming, Paul Telegdy, praised Gervais as a "true force of nature with a wicked sense of humor who always keeps everyone on their toes waiting for the unexpected." Comedy Central has reloaded its heavy artillery, drawing battle lines for November's onslaught of Conan O'Brien. The network on Tuesday extended the contracts of both Jon Stewart and Stephen Colbert, whose respective shows are popular with advertiser-coveted younger viewers and slated to go against O'Brien from 10 to 11 p.m (central) when he joins TBS in November. Stewart, host of The Daily Show since Jan. 11, 1999, will remain in place through June 2013 under his new deal with Comedy Central. 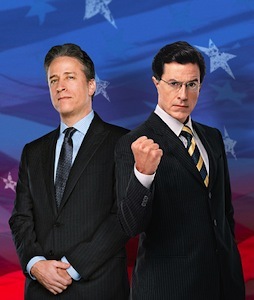 Colbert, who launched The Colbert Report on Oct. 17, 2005, is inked through the end of 2012. O'Brien, currently on a multi-city comedy tour that will bring him to SMU's sold-out McFarlin Auditorium on May 13th, made a surprise deal with TBS on April 12th. He'll be hosting a Monday-Thursday late nighter that will bump incumbent George Lopez's show to 11 p.m. in November. Lopez repeatedly has said he's on board with the move, but a healthy skepticism prevails. Although they're most popular among elusive 18-to-34-year-olds, O'Brien, Stewart and Colbert all are well beyond the outer limits of that age range. O'Brien just turned 47, Stewart also is 47 and Colbert will be 46 next month. ***HBO has renewed its acclaimed series Treme for a second season. The New Orleans-set drama, from the creator of The Wire, premiered on April 11th. None are blockbusters, but all are cost-efficient hours that have made inroads in troubled NBC time periods. So the Peacock is renewing three reality hours linked to stars who came to prominence in other hit series. 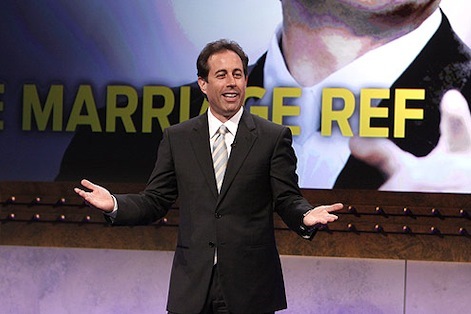 The Marriage Ref is co-executive produced by Jerry Seinfeld, who needs no further introduction. It was plugged into Thursday nights at 9 (central) after NBC jettisoned The Jay Leno Show. Who Do You Think You Are?, a genealogy show from former Friends star Lisa Kudrow's production company, is slotted on Fridays at 7 p.m., where it's made some inroads against CBS' long-entrenched Ghost Whisperer. Minute to Win It, a big money game show hosted by Guy Fieri of Food Network's Diners, Drive-Ins and Dives, recently premiered on Sunday nights as a lead-in to Celebrity Apprentice. Ratings have been acceptable, so it's getting a reprieve, too. NBC previously renewed its entire Thursday night comedy lineup of The Office, 30 Rock, Community and Parks & Recreation.